International humanitarian organisations must immediately be granted independent and unfettered access, including for international staff, to alleviate massive humanitarian needs in Rakhine State, Myanmar. The call for urgent access comes amidst the ongoing military operations in Rakhine, which started on 25 August after a new spate of attacks against police stations and a military base claimed by the Arakan Rohingya Resistance Army (ARSA). As a consequence over 400,000 Rohingya have fled to Bangladesh and are living in extremely precarious conditions with limited access to health care, potable water, latrines and food. The remaining population in Northern Rakhine, thought to be hundreds of thousands of people, is without any meaningful form of humanitarian assistance. "Alarming stories of severe violence"
“Our teams in Bangladesh are hearing alarming stories of severe violence against civilians in Northern Rakhine," says Karline Kleijer, emergency desk manager at MSF. "Reports are that there is significant internal displacement of Rohingya, ethnic Rakhine populations and other minorities. Villages and houses have been burned down, including at least two out of four of MSF’s clinics. Prior to being put on hold due to a lack of travel authorisation and a ban on international staff in mid-August, MSF was providing healthcare services in Maungdaw and Buthidaung townships in Northern Rakhine. 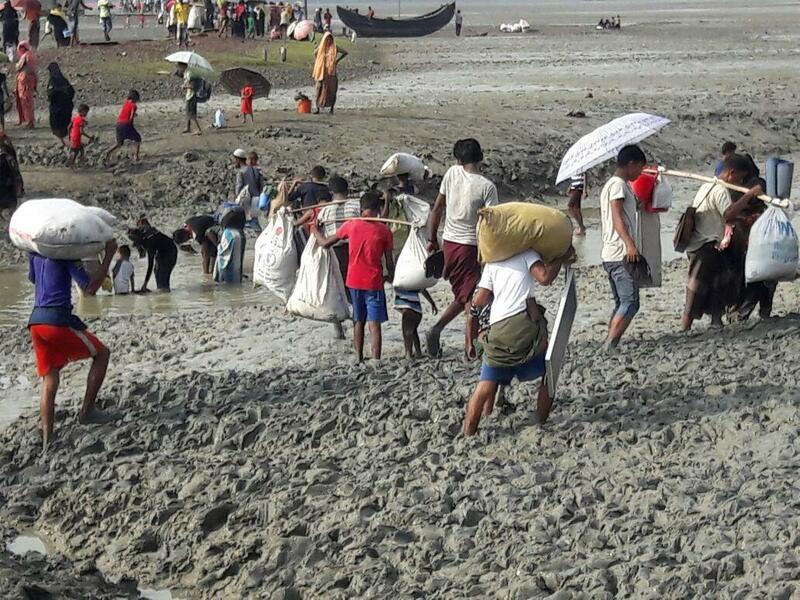 Rohingya who crossed into Bangladesh, fleeing violence in Rakhine state, Myanmar. In Central Rakhine, approximately 120,000 internally displaced people (IDPs) remain in camps where they are entirely dependent on humanitarian assistance for their survival, due to severe movement restrictions. MSF used to provide mobile clinics in several IPD camps and villages, but international staff have not been granted travel authorisations to visit the health facilities since the end of August, whilst national staff have been too afraid to go to work following remarks by Myanmar officials accusing NGOs of colluding with ARSA. Government formulated and disseminated accusations against the UN and INGOs, denial of required travel and activity authorizations, and threatening statements and actions by hardline groups, are all preventing independent humanitarian workers from providing much-needed assistance. Moreover, Northern Rakhine has been declared a military zone by the Government of Myanmar, resulting in even more severe administrative and access constraints. The Government of Myanmar says it wants to exclusively implement the humanitarian response to those affected in Rakhine, sparking fears that aid might not reach those who most need it. “This suggests Myanmar is moving towards a new modus operandi putting the delivery of humanitarian aid under the government’s exclusive control, which is likely to result in even more severe administrative and access constraints than ever,” says Benoit De Gryse, MSF’s operations manager for Myanmar. MSF is alarmed by the current lack of access to healthcare for those remaining in Rakhine. When it has full access to its clinics, MSF provides over 11,000 primary and reproductive health care consultations per month, as well as emergency transport and assistance for patients requiring hospitalisation. All these services are currently on hold, and other agencies have also reported being unable to carry out their activities in Rakhine due to lack of access. “To ensure access to medical care and to be able to provide assistance to conflict-affected people, MSF and other international humanitarian agencies must be allowed immediate and unhindered access to all areas of Rakhine State. Without this, there is a very real risk that patients will die unnecessarily,” says De Gryse.